Lynx Heli Innovations has redesigned the standard 130 X plastic swashplate, using a combination of aluminum alloy and techno polymer. Lynx swashplate look nice and is now the lightweight CNC swashplate in his class. Thanks a unique and innovative design system of the center ball, Lynx 130X swashplate weight only 2.3g (yes! Number is correct) only 0.3g heavier than plastic one. Details and design combined with strength, durability, accurate CNC tolerances, finish, and most important lightweight, will increase and assure flight precision, flight after flight, adding top performance in your 130X. 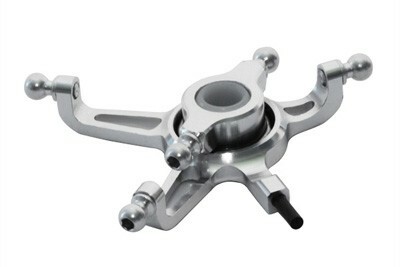 Lynx 130 X Swashplate the new frontier of lightweight and high precision swash plate for your 130X. - Aluminum Linkage balls and solid carbon fiber anti-rotation pin to minimize weight.